A quick glance at the conference agenda reveals a presentation entitled ‘A nightmare on European banking street’. The pre-lunch session promises to unnerve a few delegates who had already been warned that the outlook could be scary if they fail to prepare for the shape of things to come. We are in Rome at a gathering of fintech experts discussing the techno-future in a hilltop venue overlooking one of the world’s oldest cities which was a cauldron for change 2000 years ago. The conference has been organised by the solutions provider Objectway to consider about how the financial services industry will be impacted by the march of the machines. It’s all about AI, augmented reality and cryptocurrencies. The message is clear: companies have to adapt quickly, or they’ll fail. We await the nightmare scenario to be delivered by a fearsome individual with a shiver-inducing laugh. Instead, a small, bespectacled chap steps into the spotlight and displays an engaging line in popular references to the new technologies already changing the way we work and play. 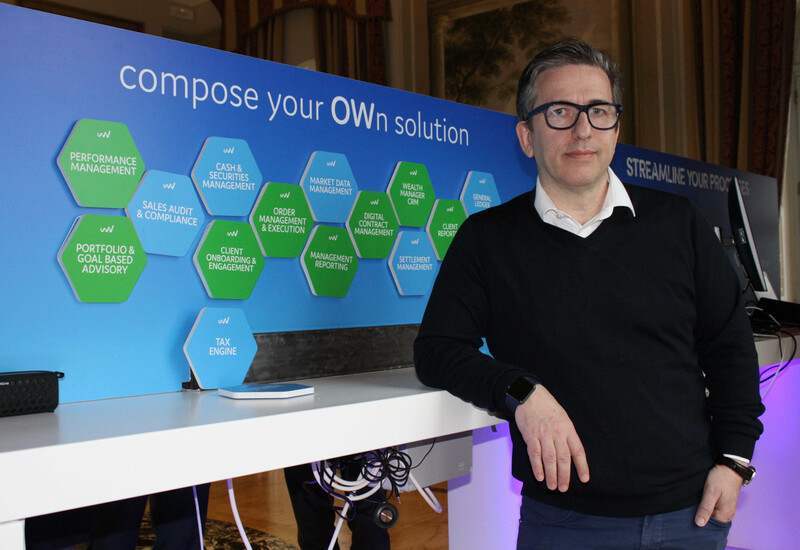 Spiros Margaris, a youthful looking fifty-something, presents his vision of the fintech-driven future with a suitably Germanic accent that adds a touch of comic-book science fiction to proceedings. When his talk is over he has time to chat about how a former hedge fund manager with Greek parents grew up in Switzerland, moved to New York, then returned home and became one of the world’s top three fintech influencers. “I’m told I sound like Arnold Schwarzenegger,” he says, murmuring to himsef: “I’ll be back,” as if confirming the comparison. However, his affable and boyish demeanour is more like Arnie meets Woody Allen, with a dose of Brian Cox’s scientific populism thrown in. Margaris outlines his case with a light touch that entertains as well as informs. He opens with a slide of Mr Spock and Captain Kirk accompanied by a caption asking why there are no banks in Star Trek. Answer: because it is set in the future. He’s talking about Amazon Payments, Amazon Cash and Amazon Lending. Tesla, the electric car company, has extended into insurance. These are the companies now shaping the financial services sector. Others are more threatening. “A US company called Robin Hood allows investors to trade stocks for free,” Margaris announces to the 200 delegates. There is an audible gasp in the room as some of the suits do a mental calculation on how this might impact their business. Margaris says another unappetising side of the fourth industrial revolution will be the prevalence of the cybercriminals. Away from all this scary talk, Margaris shows us a slide featuring the dashboard of a Ferrari. “You’d probably like one of these,” he says, then adds: “but your customers of the future will want one of these” and he switches to a second slide showing a man reading while his driverless car does the motoring. A central point to all this is how the market is becoming more customer focused. It is no longer about big companies simply selling products; customers are dictating what they want and when it suits them. Fintech is an enabler, providing the gears that drive the engine. Open banking democratises data. Digital currencies frighten central banks and governments because they are beyond their control. Augmented reality allows customers and clients to interact using visors without ever needing to meet. They are among the changes now part of today’s reality, says Margaris. He admits there are down sides to the rise of robotics that may have to be managed, but the benefits should not be underestimated. “It will destroy a lot of jobs and there will probably be a backlash against tech,” he says. “The pace of change is so fast that some people may feel overwhelmed by it and hate Silicon Valley. Career highlights: hedge fund manager with UBS and Credit Suisse; now a venture capitalist and thought leader in the fintech and insurtech sectors. What do you find most exciting about technology? It helps the less privileged to get things they could not get before and more cheaply. If you could meet three people, past or present, who would you choose?